One of the world's most maritime nations, Norway is long and narrow, with drowned valleys called fjords that bring the sea far inland in most regions. 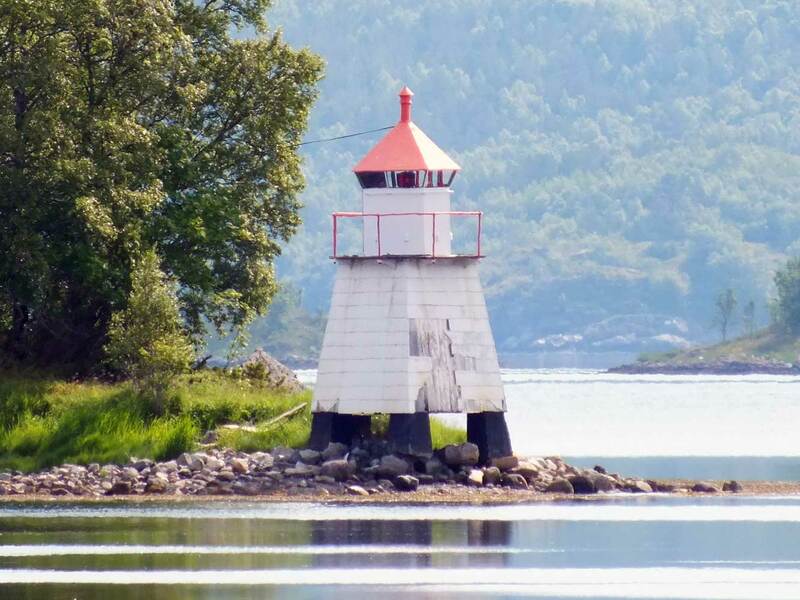 With such a lengthy and rocky shore, it's not surprising that Norway has a large number of lighthouses. 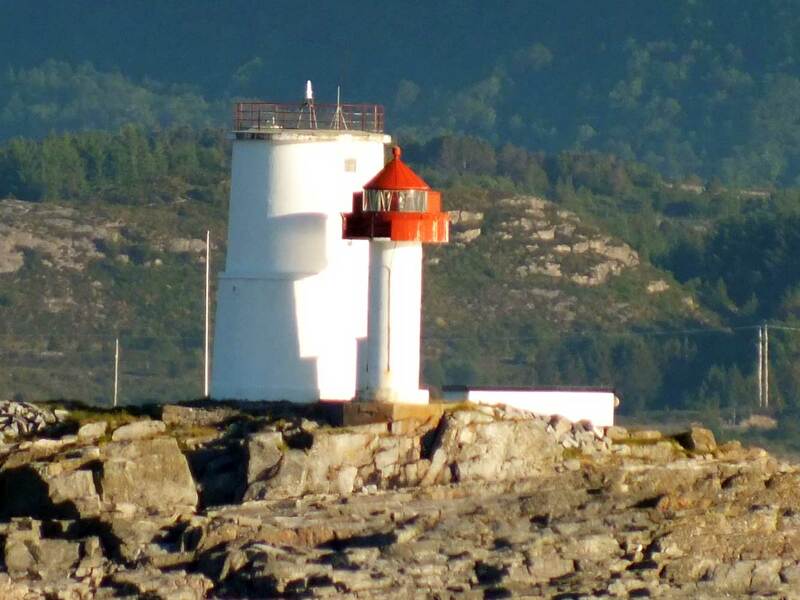 This page lists lighthouses of the northern part of Møre og Romsdal County in the central part of the west coast, including the port of Kristiansund. This region comprises the traditional district of Nordmøre. 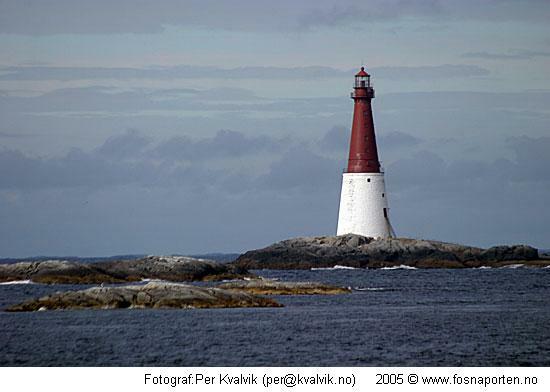 In Norway a lighthouse is simply called a fyr (fire); a smaller light is called a lykt (light). Aids to navigation are maintained by the Kystverket (Coast Directorate), an agency of the Ministry of Transport and Communications. ARLHS numbers are from the ARLHS World List of Lights. NF numbers are from the Norsk Fyrliste. Admiralty numbers are from volumes B and L of the Admiralty List of Lights & Fog Signals. U.S. NGA List numbers are from Publication 115. Photos by various photographers posted by Alexander Trabas. Many of the photos for this area are by Michael Boucher or Arno Siering. The official Norwegian light list can be downloaded in .pdf format. 1842. Inactive since 1956. 12 m (93 ft) round old-style stone tower; lantern removed. Tower painted white. A 1-1/2 story wood keeper's house, turbine house, boathouse, farm buildings, and other station buildings are all preserved at this station. Kvitholmens Venner (Friends of Kvitholmen) manage the station and its restoration; their web site has a fine collection of historic photos. Trabas has Siering's photo (also seen at right), Wikipedia has a Norwegian article on the lighthouse, the Lighthouse Association has a page for it, a sea kayaker has a report of a visit, with many photos, and Google has a satellite view of the station. 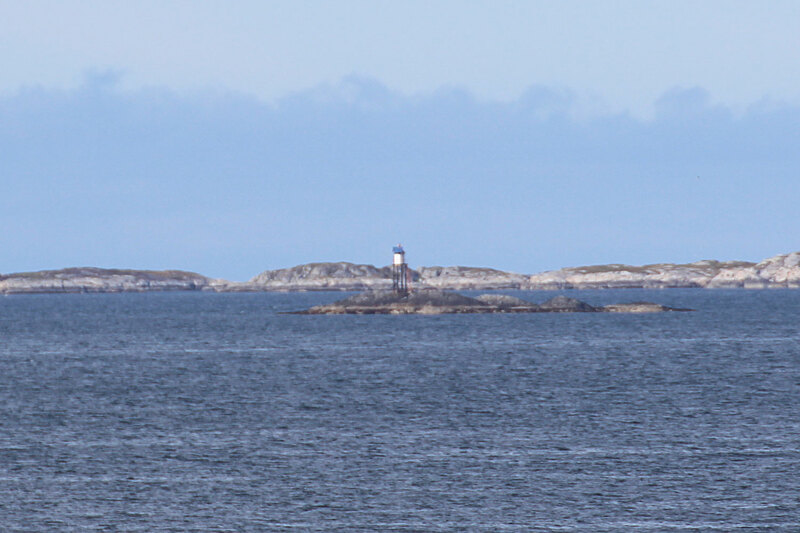 Located on a small island about 1.5 km (1 mi) offshore and about 8 km (5 mi) west of Averøy. The island is protected as a bird sanctuary. Accessible only by boat. Site and tower closed. Site manager: Kvitholmens Venner. ARLHS NOR-144. 1956 (station established 1842). 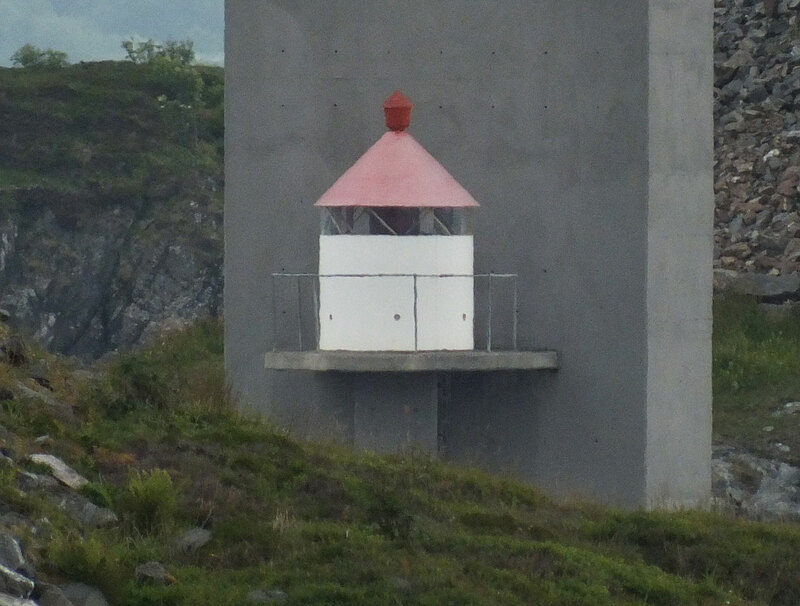 Active; focal plane 25 m (82 ft); white, red or green light, depending on direction, occulting once every 6 s. 12 m (39 ft) concrete post with lantern and gallery. Lighthouse painted white, lantern and gallery red. Trabas has Siering's photo (also seen at right). Located close to the historic lighthouse. Site and tower closed. ARLHS NOR-407; NF-3705; Admiralty L1002; NGA 6572. Date unknown. Active; focal plane 10 m (33 ft); white, red or green light, depending on direction, 3 s on, 3 s off. 10.5 m (34 ft) lantern on a platform supported by four straightpiles. Lantern painted white with a red roof. Trabas has Siering's photo, but Google has only a fuzzy satellite view of the skerry. Located on a skerry about 1.5 km (1 mi) north of Vevang. Accessible only by boat. Site open, tower closed. NF-3710; Admiralty L1006; NGA 6576. Date unknown. Active; focal plane 7 m (23 ft); white, red or green light, depending on direction, occulting once every 6 s. 8 m (26 ft) lantern and gallery mounted on tripod piles. Lantern painted white with a red roof, gallery white, piles black. Trabas has Siering's photo, David Gilmour has a view from the shore, and Google has a distant street view and a distant satellite view of the light. 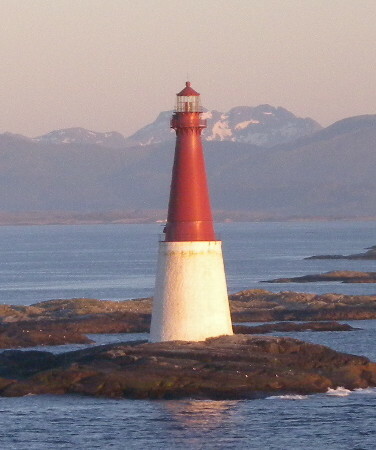 Located in the harbor of Vevang, about 6 km (3.5 mi) west of Averøy. Accessible only by boat. Site open, tower closed. NF-3716; Admiralty L1011; NGA 6588. Date unknown. Active; focal plane 17.5 m (57 ft); white, red or green light, depending on direction, occulting twice every 8 s. 19.5 m (64 ft) concrete post with lantern and gallery. Lighthouse painted white, lantern roof red. Trabas has Siering's 2012 photo, and Bing has a satellite view. Located on a reef about 5 km (3 mi) north northeast of Vevang. NF-3706; Admiralty L1004. Date unknown. Active; focal plane 7 m (23 ft); white, red or green light, depending on direction, occulting twice every 8 s. This was a 7 m (23 ft) octagonal lantern and square gallery mounted on four straight piles. Lantern painted white with a red roof; piles painted black. No photo available, although Bing has a distant satellite view of the area. 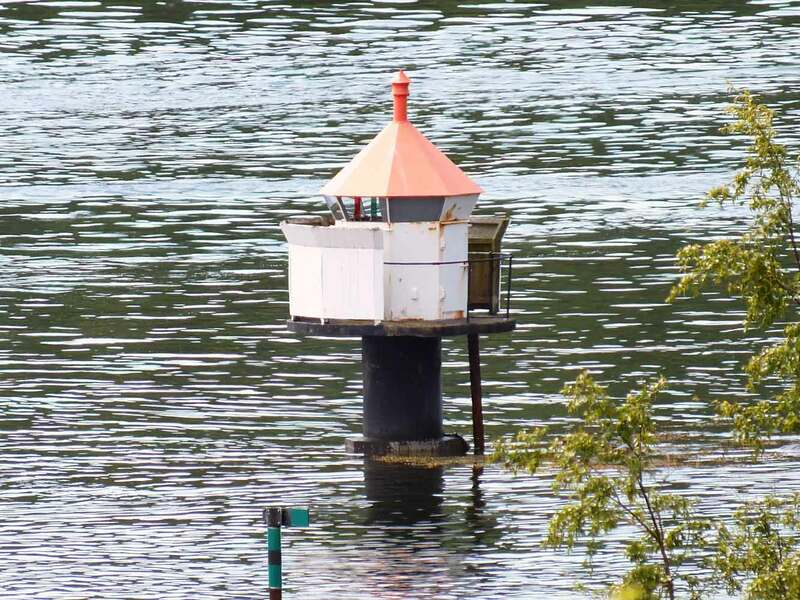 When Michael Boucher visited here in September 2011 he found that the light has been moved to a small lantern mounted on one of the piers of the bridge that carries highway 64 across the Fugleleia strait. Trabas has Siering's photo of the new light. 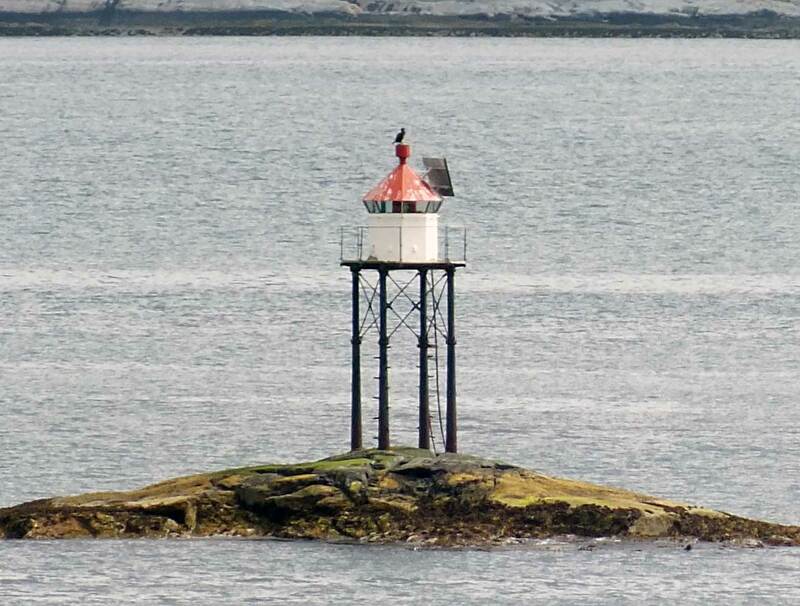 Formerly located on a skerry marking the entrance to a sound west of Averøy. Site open, tower closed. NF-3725; Admiralty L1015; NGA 6592. Date unknown. Active; focal plane 15 m (49 ft); white, red or green light, depending on direction, occulting three times every 10 s. 6 m (20 ft) square tower with lantern and gallery. Lighthouse painted white, lantern roof red. Trabas has Boucher's photo, and Bing has a satellite view. 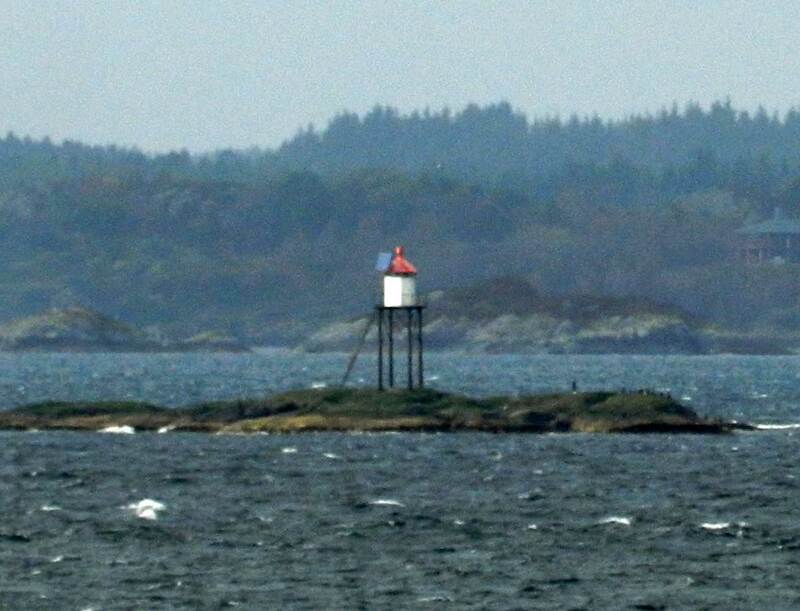 Located on a small island at the northwest corner of Averøy. Site status unknown (probably on private property). NF-3735; Admiralty L1017; NGA 6608. Date unknown. Active; focal plane 6.5 m (21 ft); white, red or green light, depending on direction, occulting twice every 8 s. 7 m (23 ft) concrete post with lantern and gallery. Lighthouse painted white, lantern roof red. No photo available, but Bing has a satellite view. Located on a skerry under a bridge (the Tjønnøybrua) at Langøy. NF-3751; Admiralty L1021; NGA 6636. 1879. Inactive since 1986. Approx. 20 m (66 ft) square tower with gallery, rising from a 3-1/2 story keeper's house. Lantern removed. Lighthouse painted white. 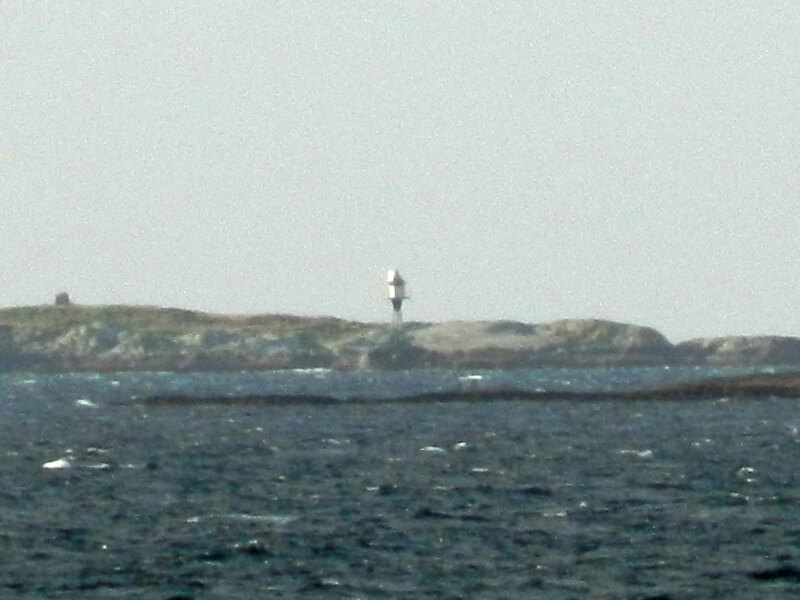 Kjell Jøran Hansen's photo is at right, Trabas has Ronald Wöhrn's photo, the Lighthouse Association has a page with a distant view, and Wikipedia's Norwegian article has a distant view. Located on a skerry about 1.4 km (0.9 mi) north of Langøy and 8 km (5 mi) northeast of Averøy. Accessible only by boat. Site and tower closed. ARLHS NOR-119. 1986 (station established 1879). Active; focal plane 24 m (79 ft); white, red or green light, depending on direction, occulting twice every 8 s. 21 m (69 ft) round cylindrical concrete tower with lantern and gallery, rising from a square 3-story building. Kjell Jøran Hansen's photo is at right, Trabas has Ronald Wöhrn's photo, Marinas.com has aerial photos of this station, and Bing has a satellite view of the station. Lighthouse painted white, lantern red. Located adjacent to the historic lighthouse. Accessible only by boat. Site and tower closed. ARLHS NOR-401; NF-3755; Admiralty L1022; NGA 6644. Date unknown. Active; focal plane 12 m (39 ft); flash every 5 s, white, red or green depending on direction. 7 m (23 ft) octagonal lantern mounted on a platform supported by piles. Lantern painted white with a red roof, piles painted black. Trabas has Siering's 2012 photo, and Google has an indistinct satellite view. 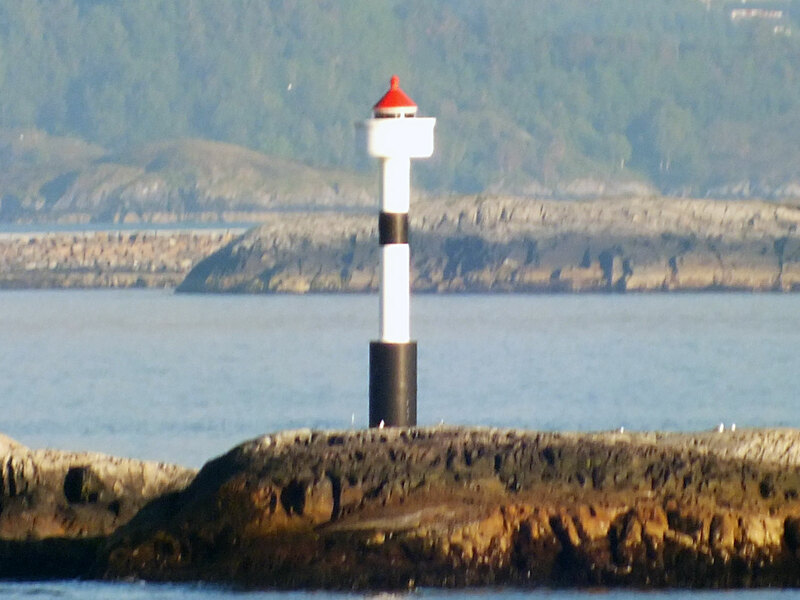 Located on the northeast point of Englen, marking the entrance to the protected harbor of Sveggesundet, about 8 km (5 mi) west of Kristiansund. Accessible only by boat. Site open, tower closed. NF-3768; Admiralty L1026; NGA 6672. 1894 (station established 1842). Active; focal plane 22 m (72 ft); white, red or green light, depending on direction, occulting in groups of three, but NGA does not list the period. Approx. 7 m (23 ft) 1-1/2 story square building with lantern mounted on the roof. Lighthouse painted white, lantern red. 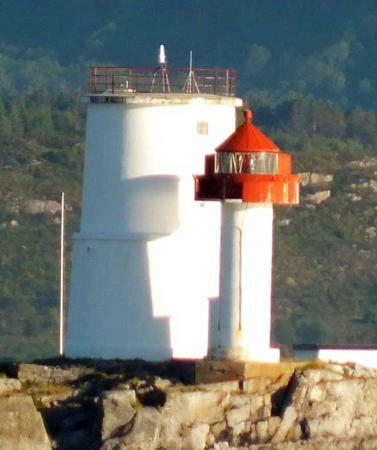 Arno Siering's 2012 photo is at the top of this page, Wikimedia has a photo by Michael Clarke and a view of the station by Trond Viggo Håpnes, Anke and Jens have a page for the lighthouse, Bash has a distant view, the Lighthouse Association has a page with a photo, Tore Indregård has a street view, and Google has a satellite view. 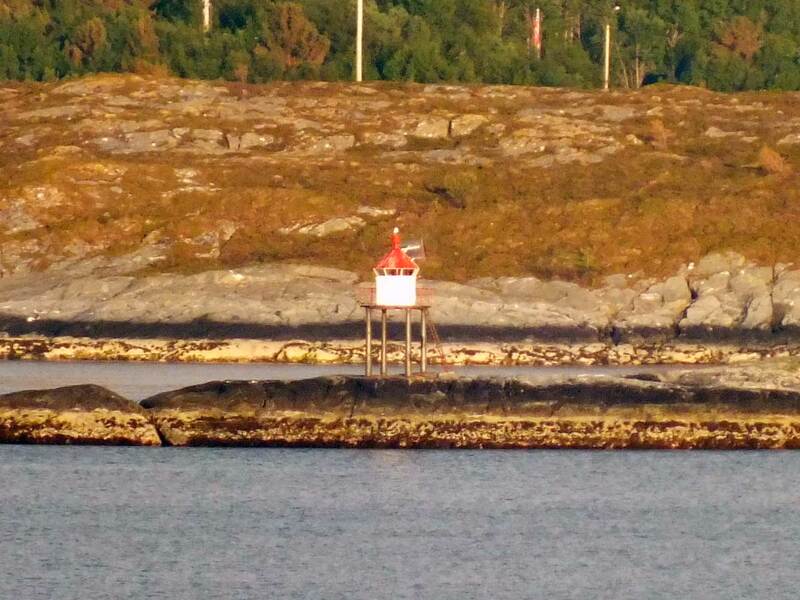 This light marks the entrance to the Sørsundet and the harbor of Kristiansund. The Kystverket leased the station to the Stavnesets Venner (Friends of Stavneset) in 2010. The friends group has restored the buildings and developed hiking trails in the area. 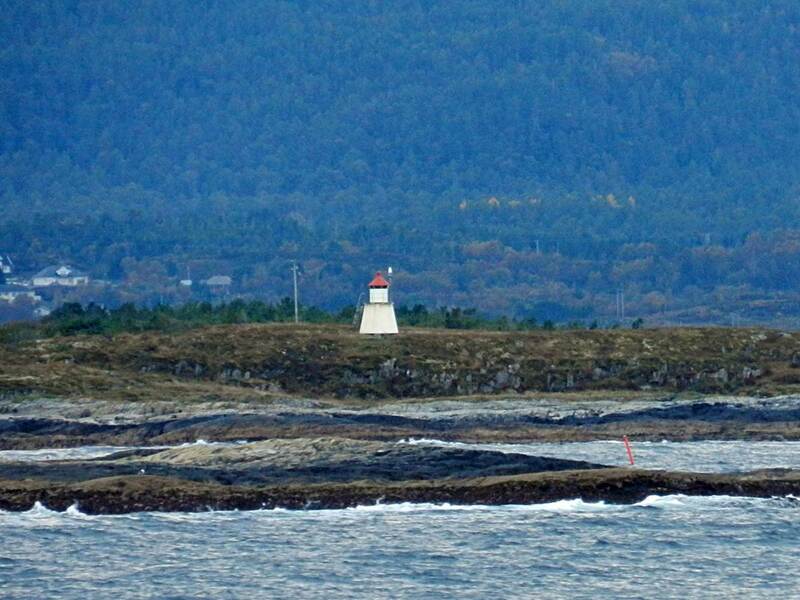 Located at the northeastern tip of Averøya about 3 km (2 mi) north of Bremsnes. Accessible by a hike of about 30 minutes from the Lynghaug chapel. Site open; lighthouse open (coffee and pastries offered) every Sunday during the summer. Site manager: Stavnesets Venner . ARLHS NOR-224; NF-3780; Admiralty L1028; NGA 6676. 1896. Active; focal plane 5 m (18 ft); white, red or green light, depending on direction, occulting once every 6 s. 5.5 m (18 ft) octagonal lantern mounted on a concrete base. Lantern painted white with a red roof. Several photos are available (second and third photos on the page), Trabas has Boucher's distant view, and Google has a satellite view. Located on a rocky point projecting into the Bremnesfjord, on the east side of the island of Averøy, about 4 km (2.4 mi) southwest of Kristiansund. Accessible only by boat. Site open, tower closed. NF-3814; Admiralty L1050; NGA 6728. Date unknown. Active; focal plane 6 m (20 ft); white, red or green light, depending on direction, occulting three times every 10 s. 6 m (20 ft) square tower with lantern and gallery. Lighthouse painted white, lantern roof red. Google has a street view and a distant satellite view. 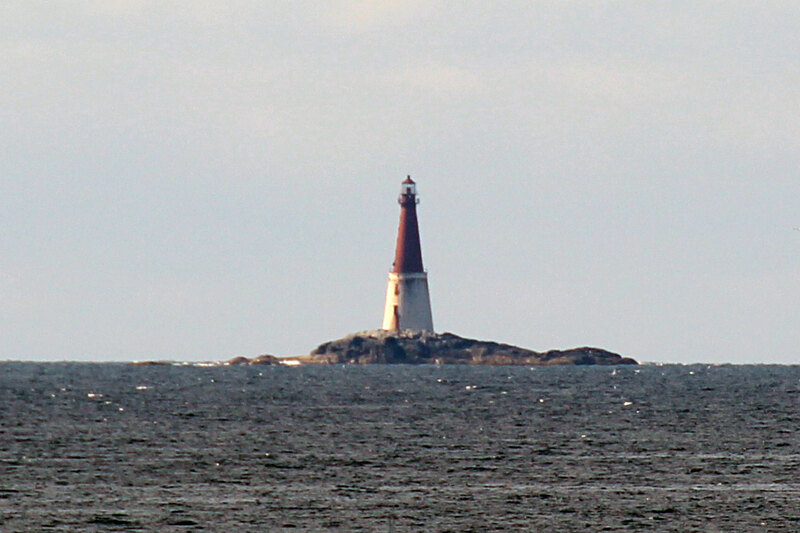 Located on the southeast side of Averøy, guiding vessels in the Kvernesfjord. Site status unknown (probably on private property). NF-3820; Admiralty L1056; NGA 6744. 1888. Active; focal plane 47 m (154 ft); white, red or green light, depending on direction, occulting twice every 8 s. 44 m (144 ft) two-stage tower: approx. 28 m (92 ft) round cast iron tower with lantern and gallery, mounted atop a 16 m (52 ft) round granite base incorporating keeper's quarters. Cast iron tower painted red, stone base white. Alfred Diem's photo is at right, Per Kvalvik has a good closeup, Trabas has Ronald Wöhrn's distant photo, Anke and Jens have a distant view, Huelse has a historic postcard image, and Bing has a satellite view. Until it was automated in 1977 this must have been one of the most difficult Norwegian stations for keepers. 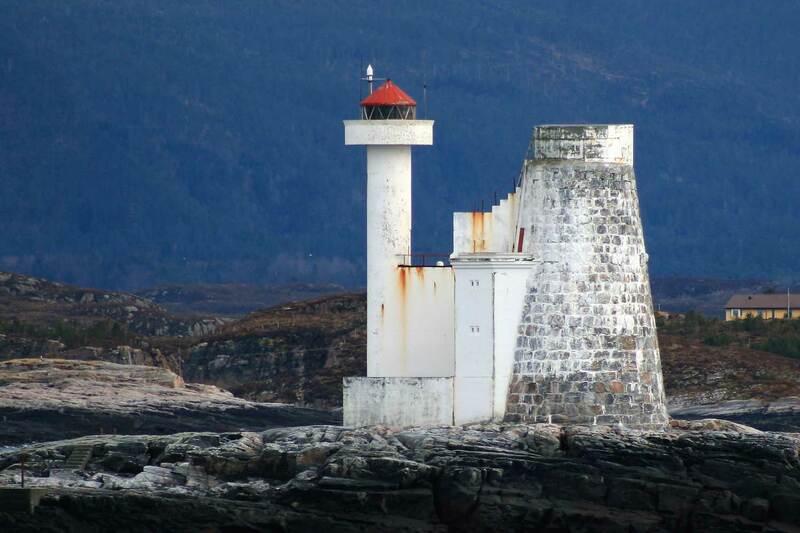 Located on a bare skerry, swept by the waves in every storm, about 6.5 km (4 mi) north of Kristiansund. Accessible only by boat in dangerous seas. Site and tower closed. ARLHS NOR-100; NF-4000; Admiralty L1126.1; NGA 6888. Date unknown. Active; focal plane 8.5 m (28 ft); white, red or green light, depending on direction, 3 s on, 3 s off. 8.5 m (28 ft) lantern mounted on a platform supported by tripod piles. Lantern painted white with a red roof, piles painted black. 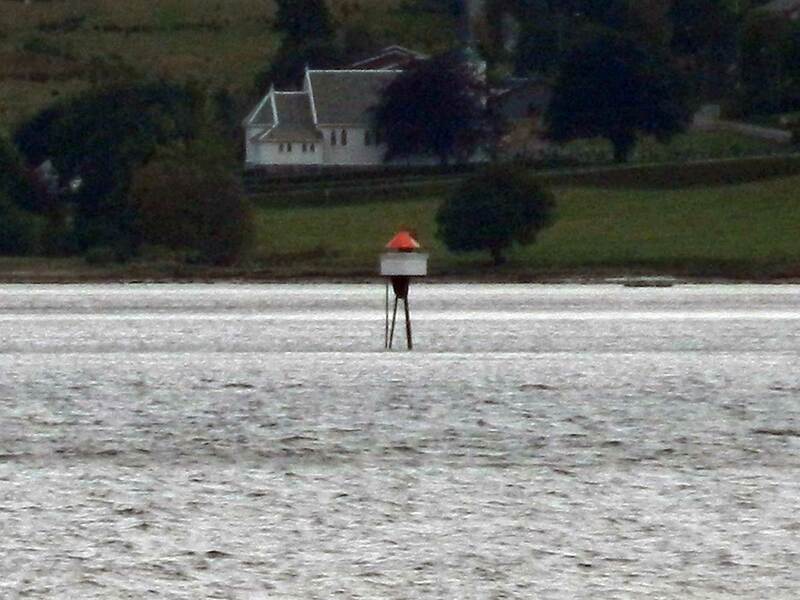 Trabas has Ronald Wöhrn's distant view, but Bing has only a distant satellite view of the skerry. Located on a skerry about 7 km (4 mi) south of Grip. Accessible only by boat. Site open, tower closed. NF-3898; Admiralty L1122; NGA 6880. Date unknown (station established 1887). Active; focal plane 31 m (102 ft); white, red or green light, depending on direction, occulting once every 6 s. 3 m (10 ft) octagonal lantern mounted directly on the ground. Lantern painted white with a red roof. Trabas has Siering's closeup photo, Bash has a view from the fjord, and Google has a satellite view. This light marks the entrance to the inner harbor of Kristiansund. 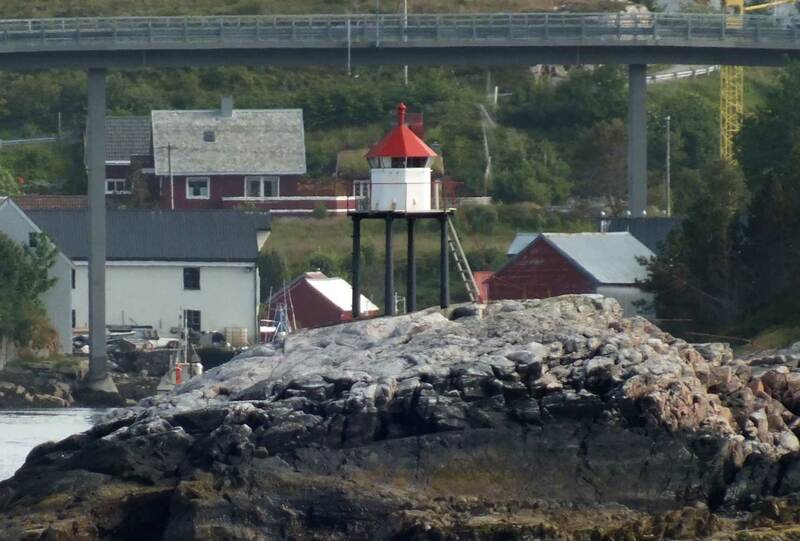 Located at the west end of Innlandet south of the Kristiansund waterfront. The island is accessible by bridge and the lighthouse is accessible by road. Site open, tower closed. ARLHS NOR-396; NF-3781; Admiralty L1030; NGA 6680. 1911 (station established 1877). Active; focal plane 17 m (56 ft); white, red or green light, depending on direction, occulting once every 6 s. 6.5 m (21 ft) square skeletal tower, covered with white siding, with lantern and gallery. Lighthouse painted white; lantern roof painted red. Trabas has Boucher's photo, a distant view is available, Bash has a very distant view, and Google has a distant satellite view. Located on a promontory on the east side of a northeastern entrance to Kristiansund, about 5 km (3 mi) northeast of the city. Site open, tower closed. NF-3801; Admiralty L1046; NGA 6716. Date unknown. Active; focal plane 5 m (17 ft); white, red or green light, depending on direction, occulting once every 6 s. 5 m (17 ft) concrete post with lantern and gallery. Lighthouse painted white; lantern roof painted red. Trabas has Siering's photo, and Google has a distant satellite view. 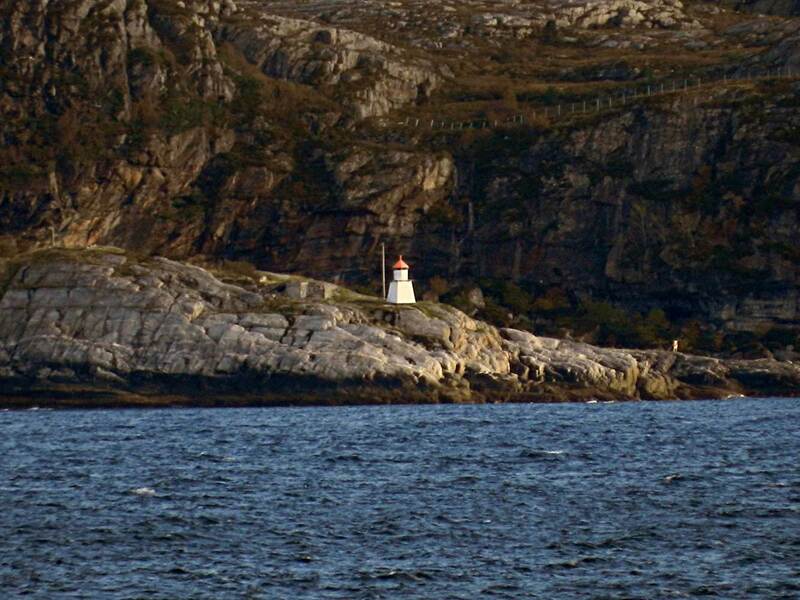 Located on a skerry in the Omsund, a narrow passage between the islands of Nordlandet and Frei, east of Kristiansund. Accessible only by boat. Site open, tower closed. NF-3810; Admiralty L1048; NGA 6720. Date unknown. Active; focal plane 6 m (20 ft); white, red or green light, depending on direction, occulting twice every 8 s. 6 m (20 ft) square tower with lantern and gallery. Lighthouse painted white; lantern roof painted red. No photo available, but Bing has a distant satellite view. 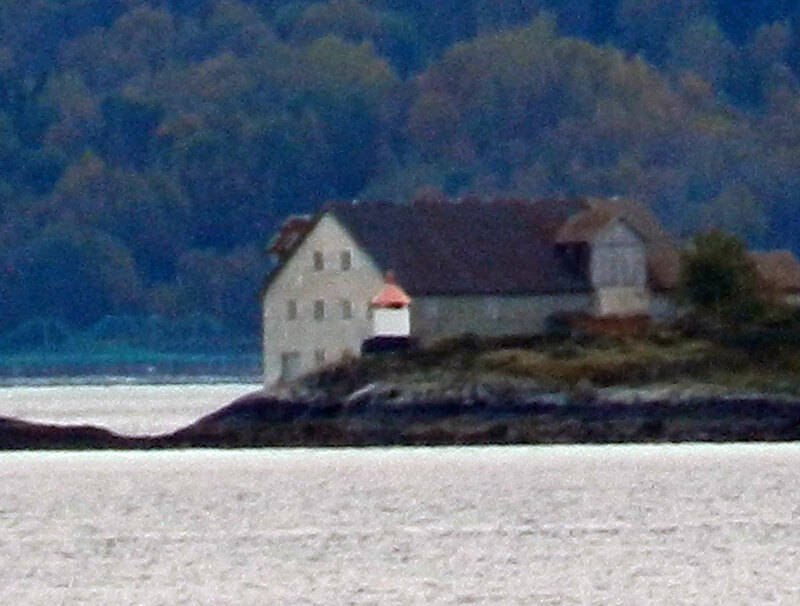 Located at the southern end of Frei, overlooking the Freifjord. Site status unknown (probably on private property). NF-3817; Admiralty L1054; NGA 6736. Date unknown. Active; focal plane 6.5 m (21 ft); flash every 5 s, white, red or green depending on direction. 6 m (20 ft) square skeletal tower, covered with white siding, with lantern and gallery. Lighthouse painted white; lantern roof painted red. No photo available, but Bing has an indistinct satellite view. Located on the eastern tip of an island on the west side of the Tingvollfjord. Accessible only by boat. Site open, tower closed. NF-3830; Admiralty L1062; NGA 6748. Date unknown. Active; focal plane 6 m (20 ft); white, red or green light, depending on direction, occulting once every 6 s. 6 m (20 ft) square skeletal tower, covered with white siding, with lantern and gallery. Lighthouse painted white; lantern roof painted red. Google has a distant street view, but the light is hard to see in Bing's satellite view of the skerry. 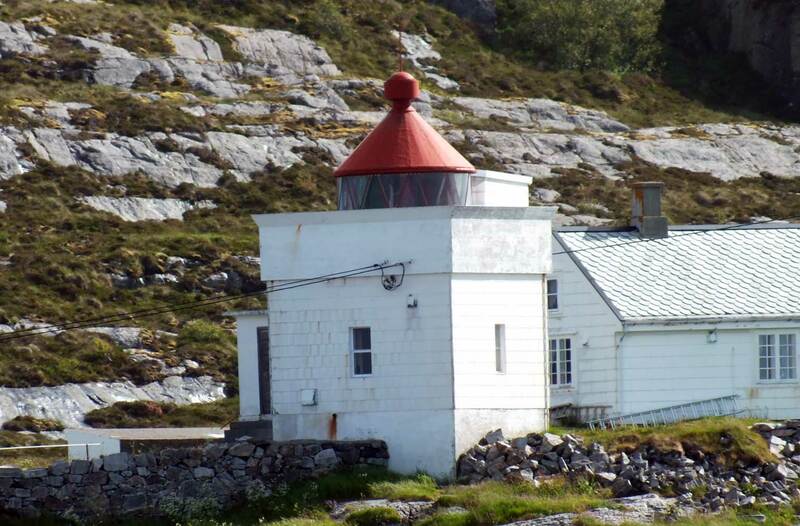 Located atop a skerry off a prominent headland on the west side of the Tingvollfjord. Accessible only by boat. Site open, tower closed. NF-3832; Admiralty L1064; NGA 6752. Date unknown. 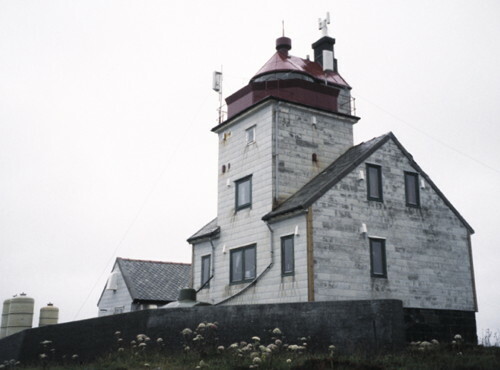 Active; focal plane 6 m (20 ft); white, red or green light, depending on direction, occulting three times every 10 s. 6 m (20 ft) square skeletal tower, covered with wood siding, with lantern and gallery. Lighthouse painted white; lantern roof painted red. No photo available, but Bing has a distant satellite view. Located on a skerry just off the north side of the upper Tingvollfjord, about 8 km (5 mi) northwest of the head of the fjord at Sunndal. Accessible only by boat. Site open, tower closed. NF-3836; Admiralty L1068; NGA 6760. Date unknown. Active; focal plane 11.5 m (38 ft); white, red or green light, depending on direction, occulting once every 6 s. 6 m (20 ft) square skeletal tower, covered with wood siding, with lantern and gallery. Lighthouse painted white; lantern roof painted red. No photo available, but Google has an indistinct satellite view. 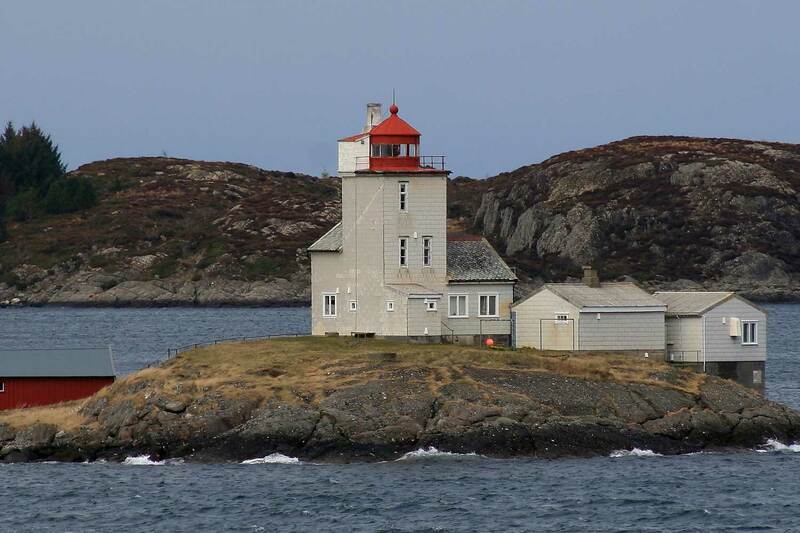 Located on the western tip of Arsundøya, about 10 km (6 mi) east of Kristiansund. Accessible only by boat. Site open, tower closed. NF-3840; Admiralty L1070; NGA 6764. Date unknown. Active; focal plane 5 m (17 ft); white, red or green light, depending on direction, occulting twice every 8 s. 6 m (20 ft) square skeletal tower, covered with white siding, with lantern and gallery. Lighthouse painted white; lantern roof painted red. Google has a street view and Bing has an indistinct satellite view of the light. Located at the tip of a prominent headland on the east side of the Trangfjord. Accessible by road. Site open, tower closed. NF-3854; Admiralty L1080; NGA 6788. Date unknown. Active; focal plane 5 m (17 ft); white, red or green light, depending on direction, occulting once every 6 s. 6 m (20 ft) square skeletal tower, covered with wood siding, with lantern and gallery. Lighthouse painted white; lantern roof painted red. A closeup photo is at right, and Bing has a satellite view. Located on a headland on the south side of the entrance to the Surnadalsfjord. Accessible by land, but probably on private property. Site status unknown. NF-3858; Admiralty L1084; NGA 6792. Date unknown. Active; focal plane 6 m (20 ft); white, red or green light, depending on direction, occulting once every 6 s. 6.5 m (21 ft) square skeletal tower, covered with wood siding, with lantern and gallery. Lighthouse painted white; lantern roof painted red. No photo available, but Bing has an indistinct satellite view. Located on a skerry on the south side of the Arasvikfjord, opposite Ertvågøy. Accessible only by boat. Site open, tower closed. NF-3882; Admiralty L1100; NGA 6824. Date unknown. Active; focal plane 12.5 m (41 ft); flash every 5 s, white, red or green depending on direction. 8 m (26 ft) lantern mounted on a platform supported by four straightpiles. Lantern painted white with a red roof, piles painted black. Trabas has Siering's photo (also seen at right), and Bing has a distant satellite view. 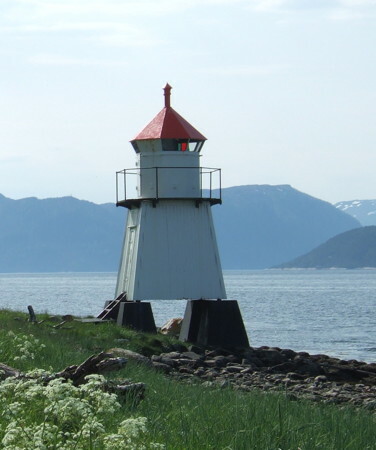 Located on a reef on the south side of the entrance to the Ytrefjord, the beginning of an inside passage to Trondheim. Accessible only by boat. Site open, tower closed. NF-4008; Admiralty L1132; NGA 6900. Date unknown. Active; focal plane 6.5 m (21 ft); white, red or green light, depending on direction, 3 s on, 3 s off. 6 m (20 ft) lantern mounted on a platform supported by four straightpiles. Lantern painted white with a red roof, piles painted black. Trabas has Siering's photo, and Bing has an indistinct satellite view. Located on a reef at the entrance to a protected sound on the south side of the Ytrefjord, about 6 km (3.5 mi) east of Lyktlangholmen. Accessible only by boat. Site open, tower closed. NF-4017; Admiralty L1140; NGA 6916. Date unknown. Active; focal plane 5.5 m (18 ft); white, red or green light, depending on direction, occulting twice every 8 s. 7 m (23 ft) lantern and gallery mounted on tripod piles. Lantern painted white with a red roof, piles painted black. Trabas has Boucher's photo, and Google has a very distant satellite view. 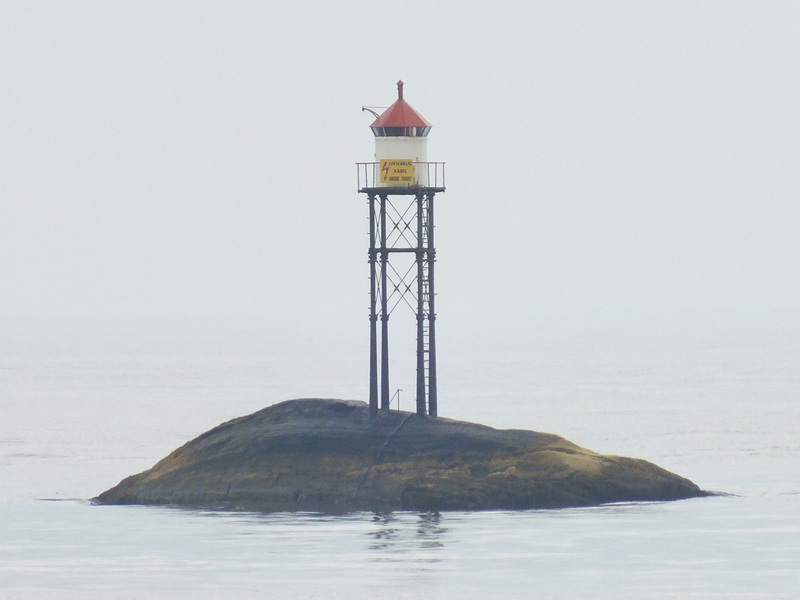 Located off the northeastern point of Tustna, marking the entrance to the narrow channel separating the islands of Tustna and Stabben. Accessible only by boat. Site open, tower closed. NF-4025; Admiralty L1142; NGA 6980. Date unknown. Inactive since 2016. 4.5 m (15 ft) lantern mounted on a stone base. Lantern painted white with a red roof. No closeup photo available, but Google has a distant satellite view and a very distant street view. It is possible that this light has been removed. 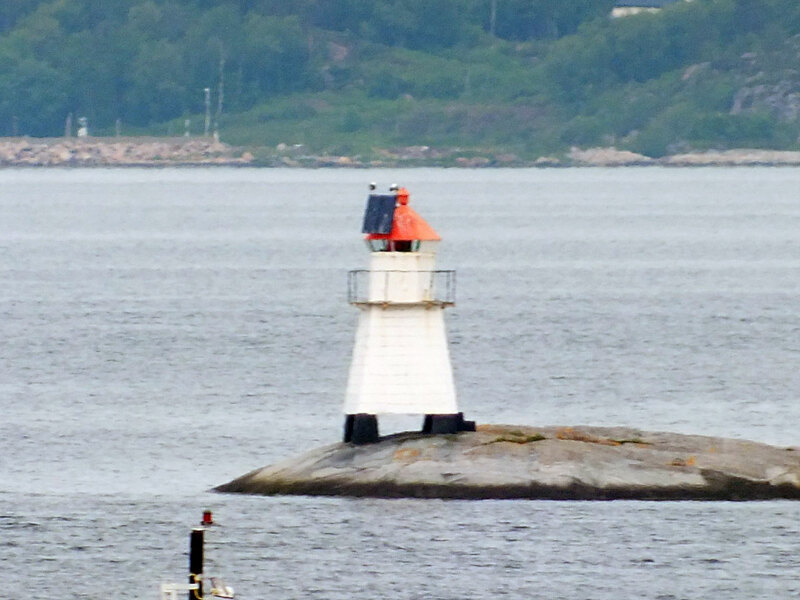 Located on a skerry guiding vessels through a narrow passage, 400 m (1/4 mi) north of the Sålåsund Bridge joining Tustna and Stabben. Accessible only by boat. Site open, tower closed. ex-NF-4026; ex-Admiralty L1144; NGA 6992. Date unknown. Inactive since 2016. 6 m (20 ft) lantern and gallery mounted on tripod piles. Lantern painted white with a red roof, piles painted black. No photo available, but Google has a distant satellite view. It is possible that this light has been removed. Located near the southern end of the Sålåsund, the narrow channel separating the islands of Tustna and Stabben. Accessible only by boat. Site open, tower closed. ex-NF-4027; ex-Admiralty L1145; NGA 7000. Date unknown. Active; focal plane 7 m (23 ft); white, red or green light, depending on direction, occulting twice every 8 s. 7 m (23 ft) square skeletal tower, covered with wood siding, with lantern and gallery. Lighthouse painted white; lantern roof painted red. Trabas has Siering's photo, a photo by Anita Lillebø is available (3/4 of the way down the page), and Bing has an indistinct satellite view. Located on a skerry about 2.5 km (1.5 mi) northwest of Aure. Accessible only by boat. Site open, tower closed. NF-3886; Admiralty L1106; NGA 6840. Date unknown. Active; focal plane 8.5 m (28 ft); white, red or green light, depending on direction, occulting three times every 12 . 10 m (33 ft) lantern on a platform supported by files. Lantern painted white with a red roof; piles painted black. Trabas has Siering's photo, and Bing has an indistinct satellite view. Located on a skerry off a promontory on the south side of the Trondheimsleia near Vinsternes. Accessible only by boat. Site open, tower closed. NF-3888; Admiralty L1108; NGA 6852. Date unknown. Active; focal plane 11.5 m (38 ft); white, red or green light, depending on direction, occulting twice every 8 s. 6 m (20 ft) concrete post with lantern and gallery. Lighthouse painted white; lantern roof painted red. No photo available, but Bing has an indistinct satellite view. Located on a promontory on the south side of the Trondheimsleia opposite the island of Jøsøy. Site status unknown. NF-3889; Admiralty L1109; NGA 6844. Date unknown. Active; focal plane 6.5 m (21 ft); flash every 5 s, white, red or green depending on direction. 7 m (23 ft) lantern and gallery mounted on four straight piles. Lantern painted white with a red roof; piles painted black. Trabas has Siering's photo (also seen at right), and Bing has an indistinct satellite view. Located on a skerry in the Trondheimsleia, north of Grisvågøya. Accessible only by boat. Site open, tower closed. NF-4054; Admiralty L1164; NGA 7036. Date unknown. Active; focal plane 5 m (17 ft); white, red or green light, depending on direction, occulting twice every 8 s. 6 m (20 ft) lantern and gallery mounted on four straight piles. Lantern painted white with a red roof; piles painted black. Trabas has Siering's photo, and Bing has an indistinct satellite view. Located on a promontory on the south side of the Torsetsund, a narrow passage off the Trondheimsleia south of the island of Skardsøy. Site status unknown. NF-3892; Admiralty L1112; NGA 6864. Date unknown. Active; focal plane 5 m (17 ft); white, red or green light, depending on direction, occulting once every 6 s. 6.5 m (21 ft) square tower with lantern and gallery. Lighthouse painted white; lantern roof painted red. Trabas has Siering's photo, and Bing has a satellite view. Located at the tip of a sharp promontory on the east side of the Dromnessund, opposite Vihalsen on Skardsøy. Site status unknown. NF-3894; Admiralty L1114; NGA 6872. Date unknown. Active; focal plane 6.5 m (21 ft); white, red or green light, depending on direction, occulting twice every 8 s. 6.5 m (21 ft) square skeletal tower, covered with wood siding, with lantern and gallery. Lighthouse painted white; lantern roof painted red. Trabas has Boucher's distant view, Google has a distant street view, and Bing has a satellite view. 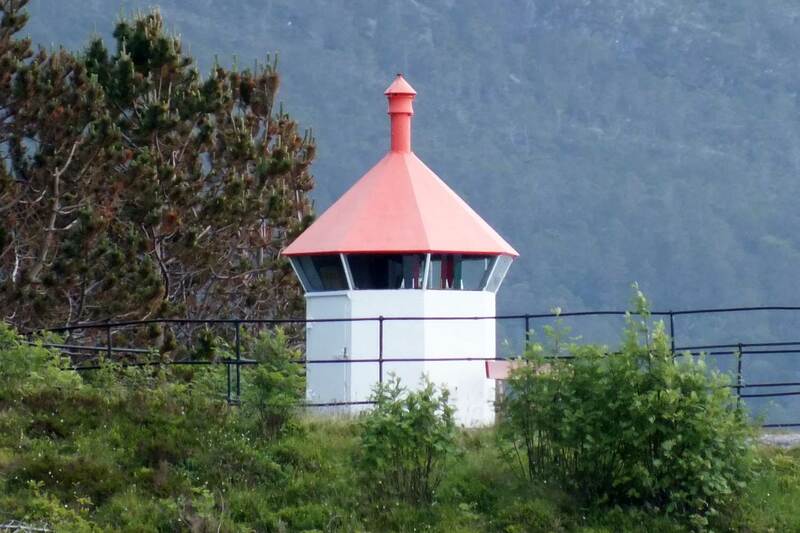 Located on a point of land at the northeastern corner of Skardsøya, marking the entrance to the Dromnessund from the Trondheimsleia. Site status unknown (the light appears to be on private property). NF-3895; Admiralty L1116; NGA 6876. Note: The Smøla municipality includes the large island of the same name and a large number of associated smaller islands. By the standards of the Norwegian coast Smøla is unusually flat, with no mountains. Date unknown. Active; focal plane 10 m (33 ft); white, red or green light, depending on direction, occulting three times every 12 s. 9 m (30 ft) lantern mounted on a platform supportd by piles. Lantern painted white with a red roof. Trabas has Ronald Wöhrn's distant view, and Bing has a distant satellite view. Located on a skerry off the southwestern coast of Smøla. Accessible only by boat. Site open, tower closed. NF-4250; Admiralty L1316; NGA 7352. Date unknown. Active; focal plane 10 m (33 ft); white, red or green light, depending on direction, 3 s on, 3 s off. 7 m (23 ft) lantern and gallery mounted on a stone cairn. Lantern painted white with a red roof. No photo available, but Bing has a distant satellite view. Located on Nordøy, a small island off the southwestern coast of Smøla. Accessible only by boat. Site open, tower closed. NF-4254; Admiralty L1318; NGA 7360. Date unknown. Active; focal plane 9.5 m (31 ft); white, red or green light, depending on direction, occulting twice every 8 s. 6 m (20 ft) square tower with lantern and gallery. Lighthouse painted white, lantern roof red. No photo available, and the light is barely visible in Google's satellite view. Located on a small island on the south side of the passage leading to Jøstølen on the west coast of Smøla. Accessible only by boat. Site open, tower closed. NF-4297; Admiralty L1342; NGA 7372. Date unknown. Active; focal plane 13.5 m (44 ft); red light occulting once every 6 s. 6 m (20 ft) square tower with lantern and gallery. Lighthouse painted white, lantern roof red. No photo available, but Google has a satellite view. Located on Kalvøy, an island about 2 km (1.2 mi) west of Jøstølen. Site status unknown (the island is privately owned). NF-4301; Admiralty L1346; NGA 7392. Date unknown. Active; focal plane 8 m (26 ft); green light, 2 s on, 2 s off. 9 m (30 ft) square tower with lantern and gallery. 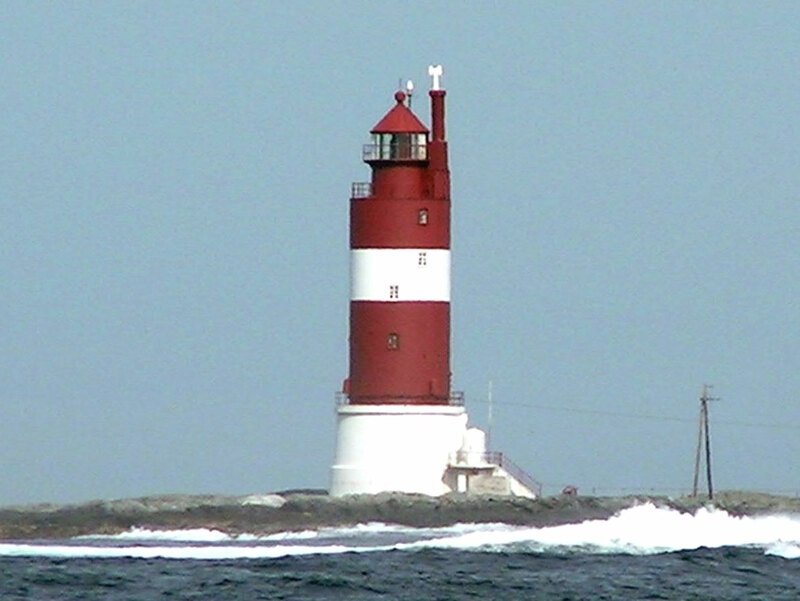 Lighthouse painted white with a black vertical stripe facing the range line, lantern roof painted red. No photo available, but Bing has a distant satellite view. 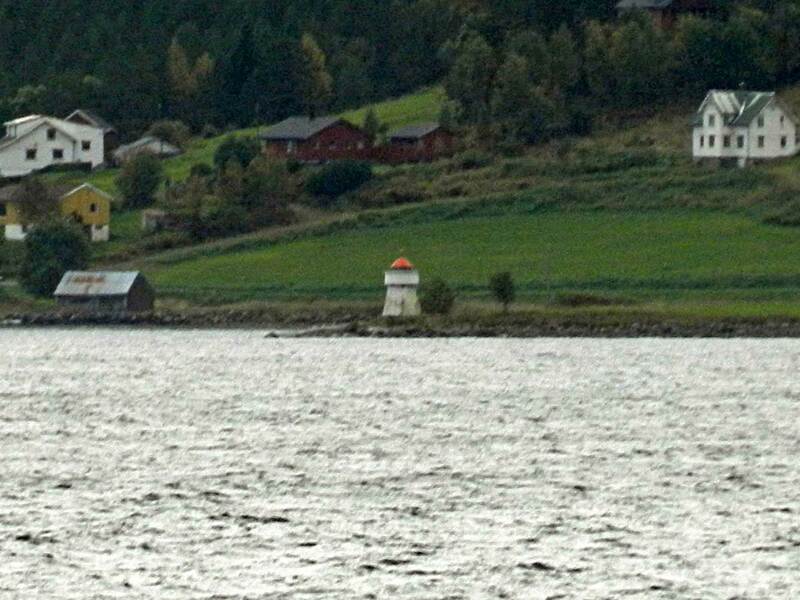 Located on a skerry on the north side of the passage leading to Jøstølen. Accessible only by boat. Site open, tower closed. NF-4299; Admiralty L1343.1; NGA 7380. Date unknown. Active; focal plane 6 m (20 ft); green light, 2 s on, 2 s off. 5 m (17 ft) lantern mounted on a platform supported by piles. Lantern painted white with a red roof. No photo available, but Bing has an indistinct satellite view. 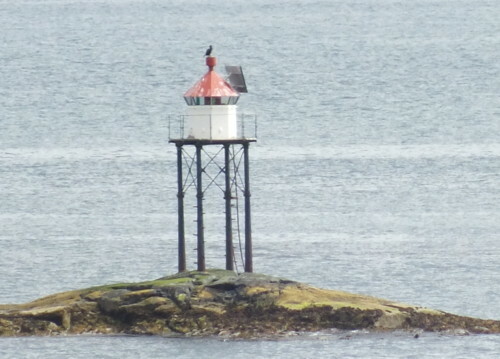 Located on a skerry 219 m (719 ft) west southwest of the front light. Accessible only by boat. Site open, tower closed. NF-4298; Admiralty L1343; NGA 7376. Date unknown. Active; focal plane 7 m (23 ft); white, red or green light, depending on direction, occulting three times every 12 s. 9 m (30 ft) lantern mounted on a platform supported by piles. Lantern painted white with a red roof. No photo available, but Bing has a distant satellite view. Located on a skerry about 4 km (2.5 mi) north of Dyrnes. Accessible only by boat. Site open, tower closed. NF-4339; Admiralty L1351; NGA 7444. 1962 (station established 1907). Inactive since 2014. 16 m (52 ft) tower with lantern and gallery attached to a 1-1/2 story wood keeper's house. Marinas.com has aerial photos, and Bing has a good satellite view of the station. Norwegian Wikimedia has an article with a historic photo. This abandoned historic lighthouse is clearly endangered. 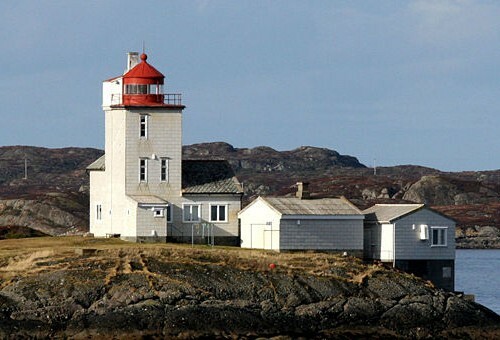 A Tidens Krav article, with a photo of the lighthouse, is about the severe storm of New Year's Day 1992; the island recorded a wind gust of 223 km/h (139 mi/h), the strongest wind ever recorded in Norway. Located on a small island about 5 km (3 mi) northwest of Dyrnesvågen, off the northwestern tip of Smøla. Accessible only by boat. Site and tower status unknown. ARLHS NOR-203; ex-NF-4330; ex-Admiralty L1348; ex-NGA 7428. Date unknown. Active; focal plane 12 m (39 ft); white, red or green light, depending on direction, 3 s on, 3 s off. 7.5 m (25 ft) square tower with lantern and gallery. Lighthouse painted white, lantern roof red. No photo available, but Bing has a satellite view. 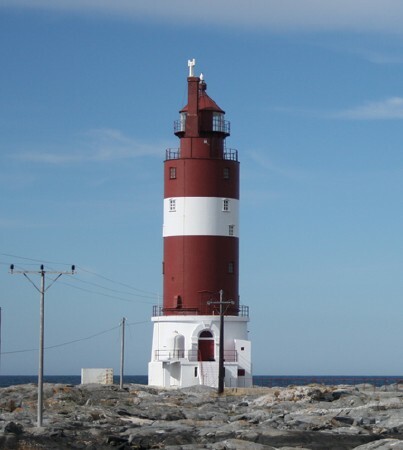 Located on a small island about 5 km (3 mi) east of the Skalmen lighthouse. Accessible only by boat. Site open, tower closed. NF-4335; Admiralty L1350; NGA 7440. Date unknown. Active; focal plane 6.5 m (21 ft); white, red or green light, depending on direction, occulting once every 6 s. 6.5 m (21 ft) lantern on a platform supported by four piles. Lantern painted white with red roof, piles painted black. No photo available, but Bing has a fuzzy satellite view. 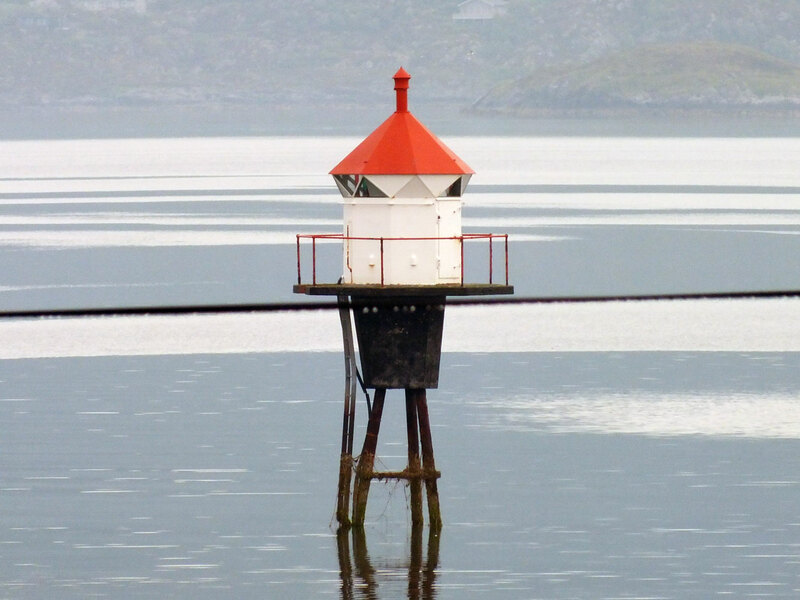 Located on the north side of the entrance to the Singsund, which leads to Veiholmen, the northernmost town in Smøla. Accessible only by boat. Site open, tower closed. NF-4340; Admiralty L1352; NGA 7452. 1922 (station established 1919). 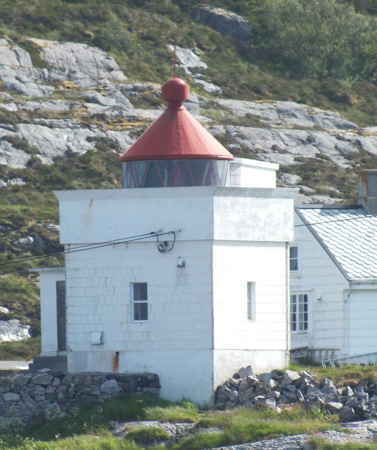 Active; focal plane 26 m (85 ft); white, red or green light, depending on direction, occulting twice every 8 s. 28 m (92 ft) round cylindrical cast iron tower with lantern and gallery, incorporating keeper's quarters, mounted on a round concrete base. Tower painted red with one white horizontal band; the concrete base is white. Kjell Jøran Hansen's photo is at right, Wikimedia has another photo by Hansen, Trabas has a photo by Pauline and Wim de Kleine, Rahul Anantharaman has a good photo, and Bing has a distant satellite view. Automated in 1988, the lighthouse is now open for day tours and available for overnight accommodations. 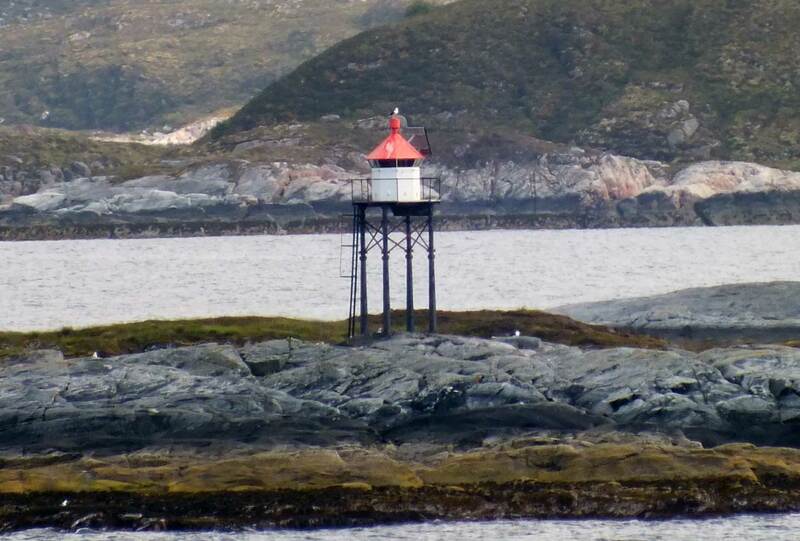 Located on a waveswept skerry about 1 km (0.6 mi) north of Veiholmen on the north side of Smøla. Accessible only by boat. Site open, tower open to guided tours. Site manager: Veiholmen Fyr. ARLHS NOR-109; NF-4350; Admiralty L1362; NGA 7488. Date unknown. Active; focal plane 6 m (20 ft); white, red or green light, depending on direction, occulting once every 6 s. 6 m (20 ft) lantern and gallery mounted on four straight piles. Lantern painted white with a red roof; piles painted black. Hanne Wollan has a fine photo, and Google has an indistinct satellite view. Located on Sondre Leiskjær, a skerry about 2 km (1.25 mi) east of Veiholmen. Accessible only by boat. Site open, tower closed. NF-4352; Admiralty L1364; NGA 7512. Date unknown. Active; focal plane 5.5 m (18 ft); white, red or green light, depending on direction, occulting twice every 8 s. 5 m (17 ft) square tower with lantern and gallery. Lighthouse painted white, lantern roof red. No photo available, but Google has an indistinct satellite view. 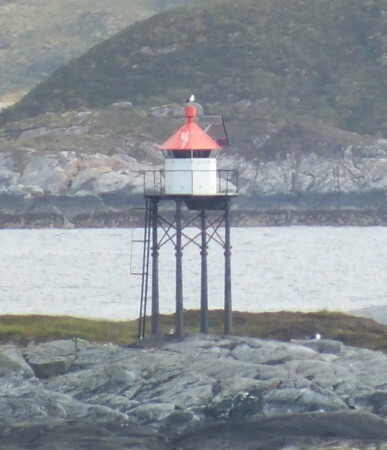 Located on a skerry off the northeast coast of Smøla. NF-4410; Admiralty L1376; NGA 7648. Date unknown. Active; focal plane 9 m (30 ft); two flashes every 5 s, white, red or green, depending on direction. 7 m (23 ft) lantern and gallery mounted on four straight piles. Lantern painted white with a red roof, piles painted black. Trabas has Boucher's distant view, but Bing has only a very distant satellite view. 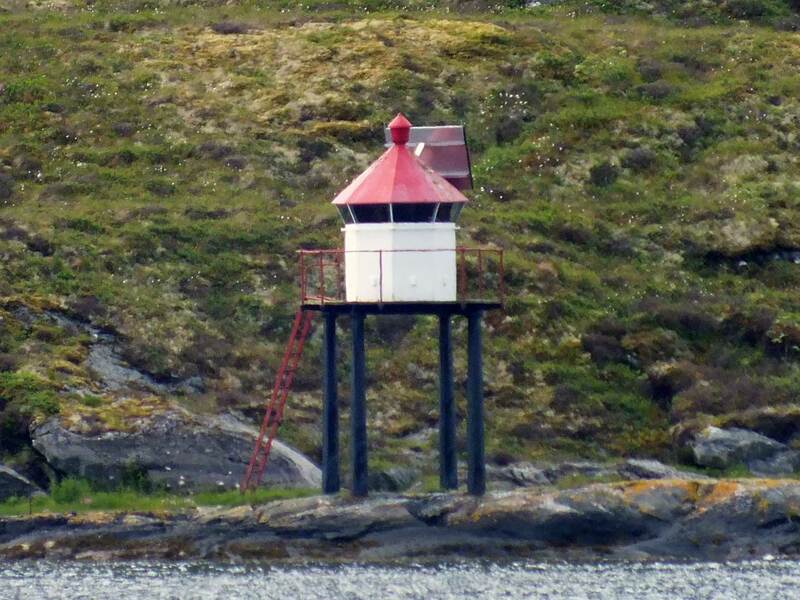 Located on a skerry in open water about 5 km (3 mi) east of the eastern point of Smøla. Accessible only by boat. Site open, tower closed. NF-4390; Admiralty L1374; NGA 7616. 1833. Active; focal plane 18 m (59 ft); white, red or green light, depending on direction, occulting twice but NGA does not list the period. 14 m (46 ft) square cylindrical tower attached to a keeper's house. Lighthouse painted white; lantern painted red. 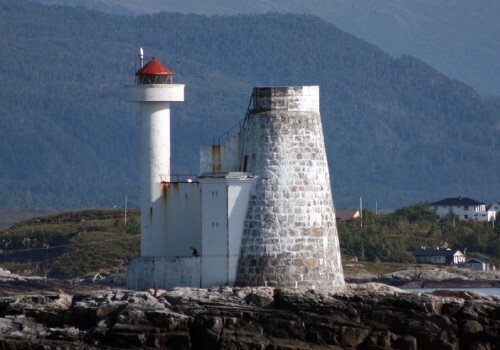 A photo is at right, Trabas has Ronald Wöhrn's photo, Wikimedia has several photos, Lightphotos.net has Patrick Healy's photo, Bash has a photo, the Lighthouse Association has a page with a view from the sea, and Bing has a satellite view. Located on Ringholmen, a small island off the east end of Edøy, which is an island off the southeast coast of Smøla. 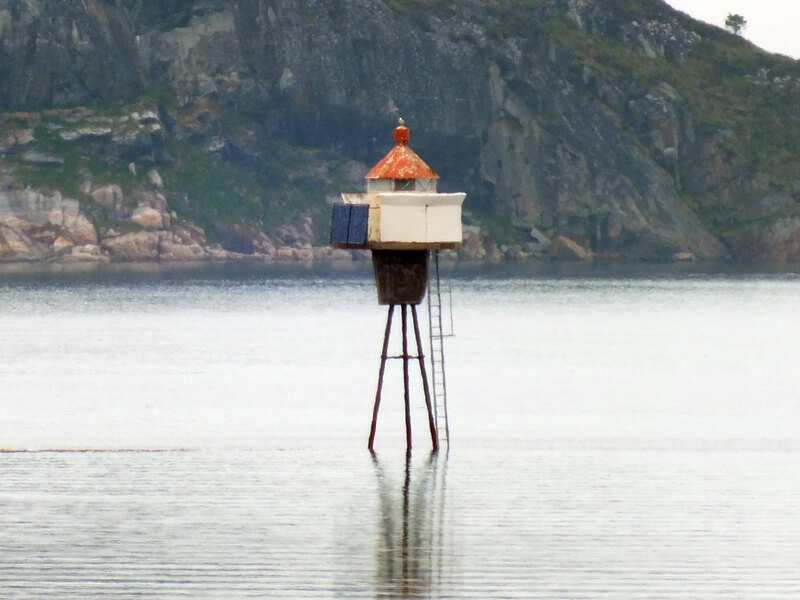 Accessible only by boat, but there should be a good view from Edøy. Site open, tower closed. ARLHS NOR-257; NF-4034; Admiralty L1152; NGA 7020. Posted June 19, 2006. Checked and revised July 2, 2018. Lighthouses: 52. Site copyright 2018 Russ Rowlett and the University of North Carolina at Chapel Hill.